My nasty “cold” has been diagnosed as Influenza A, so it’s bed rest for 48 hours. And, of course, blogging about why Ebola gets all the news but not good ‘ol killers like influenza. 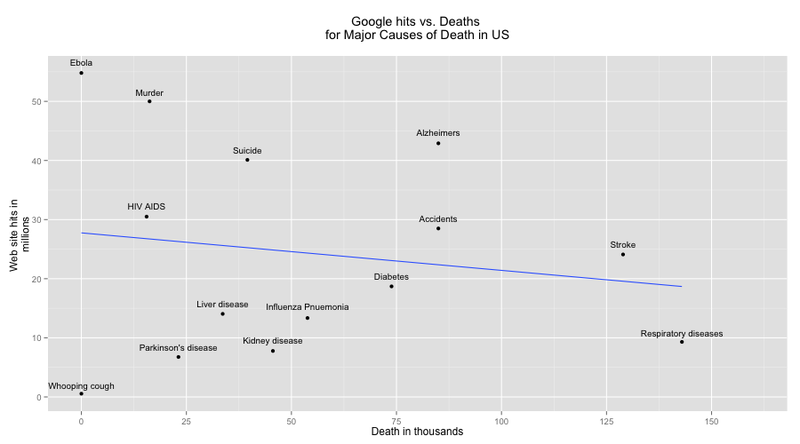 I got CDC figures for deaths and then ran Google searches for the related terms, totaling the number of hits. I was surprised at first. The number of hits seemed to roughly correspond to the death rate. Ebola was way off, massively over reported, but the general trend seemed right. However . . . . But that’s just an artifact of cancer and heart disease, which kill four times as many Americans as the “runner up,” respiratory diseases. Once we remove these two, the data shows what I was looking for: presence on the web and mortality have no discernable relationship. In fact, the weak correlation is negative. Respiratory diseases are the number one killer after the cancer and heart disease, but they are not, it seems, web savvy. Same for kidney disease. Anyone have a t-shirt from the “Nephrotic syndrome 5K and Fun Run”? Didn’t think so. And don’t get me started on the flu, the Rodney Dangerfield of infectious diseases. In some cases, the abundance of websites makes sense. HIV AIDS transmission has plummeted becasue of public education. But why is Alzheimer’s a web sensation, whereas stroke is ho-hum? And, in some cases, these mismatches point to dangerous pubic confusion about risk. Heart attacks are considered a “man’s problem” but it’s a major cause of death for women. The relatively weak web presence of heart disease probably flags this gendered misperception, which then leads to the under-diagnosis and under-treatment of women.